Mumbai, January 30, 2013: Dena Bank, India’s ‘Trusted Family Bank’, has announced that its Net Profit for the quarter ended December 31, 2012, has risen 10.58 % to Rs. 206.44 crore (unaudited) from Rs. 186.68 crore in Q3 FY 2013. The Total Income of the Bank grew 33.05% to Rs. 2408.42 crore (unaudited) from Rs. 1810.21 crore in Q3 FY 2013. The Board of Directors of Dena Bank Limited at its meeting held at Mumbai today, approved the audited accounts of the Bank for the quarter ended December 31, 2012. 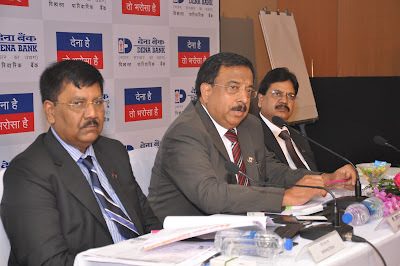 Shri Ashwani Kumar, Chairman and Managing Director, Dena Bank, announced the performance of the Bank after the adoption of the financial results for the quarter /Nine Months ended 31st December 2012 by the Board of Directors. During Q3 FY 2013, Dena Bank’s Operating Profit grew 12.69% to Rs. 443.08 crore. The Net Interest Income (NII) grew by 13.62% to Rs. 614.90 crore. Net Interest Margin was down by 45 bps at 2.88%. The Gross NPA Ratio rose from 1.85% to 2.09%. Net NPA Ratio grew from 1.10% to 1.31%. The Business Mix rose by 27.23%. The CASA stood at 30.98%. Agriculture Credit grew by 56.91%. MSME Credit grew by 28.69%. Retail Banking Credit grew by 15.90%. Capital Adequacy Ratio (Basel- II) stood at 11.47%. Tier I Capital increased by 19.15%. The Net Worth of the Bank at Rs. 4781.35 crore grew by 21.45%. Earning Per Share (EPS) stood at Rs.5.90 by 5.36%. The Net profit of Dena Bank for the Nine Months ended 31st December 2012 increased to Rs. 684.72 cr as against Rs. 548.35 cr for nine months of previous financial year recording an increase of Rs. 136.37 cr (24.87%). The operating profit of the Bank for the Nine Months ended 31st December 2012 was at Rs. 1,338.11 cr as against Rs.1,052.91 cr for nine months of previous fiscal recording an increase of Rs. 285.20 cr (27.09%). During nine months of current financial year, the Total income stood at Rs. 7,015.11 cr in comparison with Rs. 5,209.94 cr for Nine Months ended 31.12.2011 showing an increase of Rs. 1,805.17 cr [34.65%]. On comparison with nine months of FY 2011-12, the Interest income increased by Rs. 1,756.87 cr from Rs. 4,838.25 cr to reach Rs. 6,595.12 cr [36.31%] for the nine months ended 31.12.2012. Non-interest income was at Rs. 419.99 cr as at 31.12.2012 as compared to Rs. 371.69 cr during nine months of previous financial year showing an increase of 12.99% . The Net interest Income [NII] for nine months ended 31.12.2012 was at Rs. 1,821.13 crs compared to Rs. 1,502.64 cr during the nine months of previous financial year recording a growth of 21.20%. Return on Assets [ROA] was at 0.99%, and Return on Equity [ROE] was at 19.70% for the Nine Months ended December 2012. (Annualized). Cost to Income Ratio was at 40.29% for the Nine Months ended December 2012. Earnings per share increased to Rs. 19.56 as at 31.12.2012 as against Rs. 16.45 as at 30.12.2011. (annualized). Book Value per Share rose to Rs. 141.66 as at 31.12.2012 when compared to Rs. 123.72 as at 31.12.2011. Net Interest Margin: The Interest Spread to average interest bearing assets for Nine Months ended 31.12.2012 was at 2.92%. (Annualized). The Net Profit per employee was at Rs. 8.15 lakhs and the Net Profit per Branch was at Rs. 68.18 lakhs as at 31.12.2012. (annualized). Dena Bank was founded on May 26, 1938 by the family of Devkaran Nanjee under the name Devkaran Nanjee Banking Company Ltd. It became a Public Ltd. Company in December 1939 and later the name was changed to Dena Bank Ltd. Dena Bank is amongst the first nationalised banks to enter equity market in November 1996. It offers the entire gamut of banking services including Retail Banking, Corporate Banking, International Banking, Services, Priority & SME Banking amongst others. The Bank is the first public sector bank to introduce Tele-Banking facilities for its customers at selected metropolitan centers. Dena Bank offers minor savings scheme, credit card in rural India and customer rating system for rating the bank services.